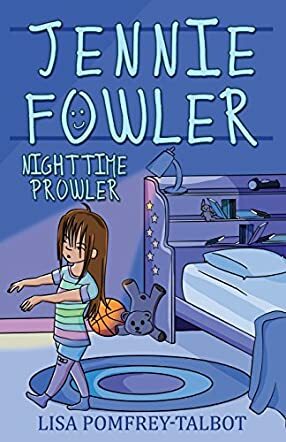 Jennie Fowler Nighttime Prowler by Lisa Pomfrey-Talbot is a delightful children's book about a young girl named Jennie. Jennie is just an ordinary girl who wants to go to camp, except she sleepwalks. She has had many sleepwalking incidents, including one where she dumped a mixture of food on her sister, Lexy. Jennie's mother doesn't want her to go to camp, because she's worried Jennie might sleepwalk away and get eaten by a bear. Eventually, Jennie's friends convince her mom to let her attend camp. Jennie's friend, Trinity, has a plan to keep Jennie safe in case she sleepwalks. Will her plan work? I really enjoyed reading Jennie Fowler Nighttime Prowler by Lisa Pomfrey-Talbot. The book is full of excitement and suspense. The story also has many funny parts that made me laugh out loud. It also has a few parts that made me gasp. The book is very well written and descriptive. The pictures depict each scene vividly and are well drawn. I was hooked by the first page, and I never wanted to put the book down. This is a real page turner and will keep the reader on the edge of their seat. The characters are very likeable, because Jennie's friends and family want to keep her safe when she sleepwalks. I liked that Jennie, Hudson, and Lexy behaved just like most siblings do. The book is relatable and realistic, because sleepwalking is a problem many people face. I would definitely recommend this book to everyone.